The G3 and G4 series of Britax convertible car seats pack a lot of features into one seat! Color coded seat belt lockoffs for both rear and forward facing make seat belt installation very user-friendly. Always use the lockoff closest to your seat belt buckle. Two adjustable crotch strap positions measuring 5″ and 7″ allow for plenty of room for both smaller and larger children. Britax states in their manual that for rear facing the strap needs to be in the inner slot when installing via seat belt and the slot closest to but not under the child when installing via lower anchors. For forward facing, the crotch strap needs to be in the outer slot for children over 30 pounds. You also use the outer slot if the buckle is under the child when using the inner slot. Three adjustable recline positions make it easy to get installed at the correct angle rear facing. Only position three (fully reclined) can be used rear facing. Position 1 or 2 can be used forward facing, but position one has to be used for children over 40 pounds when installing via lap belt only. Push button lower anchor connectors make lower anchor installation a breeze. Attach the connector on to the lower anchor in the vehicle and pull the webbing tight. The storage area of the lower anchors are on the back of the seat base. They clip in nicely for out of the way storage when installing via seat belt. No rethread harness (10 positions) allows the caregiver to move the harness without uninstalling the seat and rethreading the harness. Anti-rebound bar is available to purchase separately via Britax (not to be used with the rear facing tether). This is a nice add-on that Britax has recently added to their online store. Rear facing tether available on certain model dates, if stated in the user manual (not to be used with the anti-rebound bar). Some older models that still allow rear face tethering come with a metal d-ring. Newer models that still allow it will come with a loop on either end of a strap. The instruction manual shows how to use the connector strap. Note: Many vehicles no longer allow rear facing tether use. Infant positioning pillow is required for infants who weigh up to 22 pounds and not permitted for children who weigh more than 22 pounds. This insert improves the fit for the tiniest of passengers. Britax has taken a back to basics approach with their newest convertibles and updated several features to make them more user-friendly. Britax has moved away from acronyms to spelling out the full features. HUGS, for example, are now referred to as impact absorbing chest pads. They’ve updated their labels and their boxes to match this change. Britax is also moving away from the white boxes to a brown box that doesn’t show the wear and tear a box goes through in shipping. The recline and head support adjustment levers have also switched from grey to red to make them easier to find and thus more user-friendly. 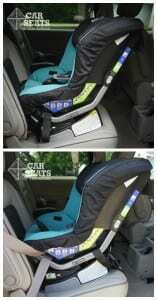 As of February 2014, car seats must have labels stating the child’s weight limit for the use of lower anchors. The new Britax seats have these updated labels with the current lower anchor limits clearly listed on the side for both rear facing and forward facing. Britax has shortened their tether straps, but do offer a tether extension if needed. The biggest change they’ve instituted is moving away from a rear facing tether to an anti-rebound bar (ARB). The ARB is available separately via Britax.com. Many vehicles no longer allow seats to tether rear facing due to occupant detection systems, so Britax has decided the ARB is an easy fix: no more having to figure out if your vehicle allows a rear facing tether or not. This is a rolling change to the non ClickTight convertibles, so some will still allow you to tether while rear facing; others will not. If your manual allows it, please make sure to check with your vehicle manufacturer to make sure they allow it as well. Britax has one unique feature that most other convertibles don’t have: individual lower anchor connectors on each side. This means that one strap doesn’t have to be pulled tight through the seat which can sometimes cause it to bind up in the belt path. The individual adjusters make for an easy lower anchor installation. Lower anchors can be used until the child weighs 40 pounds. This means the seat can always be installed with the lower anchors when rear facing if your seating position allows. The Boulevard does not allow for borrowing lower anchors from outboard seating positions. It does allow for overhang for those with shallow vehicle seats. Up to 3″ of the seat can hang off the edge assuming you can get a good installation. If a seat belt installation is preferred, that method is easy as well with Britax’s seat belt lockoffs. They are found by lifting the cover. Just open the lock off closest to your seat belt buckle, thread the belt through the rear facing belt path, buckle and tighten. Then flip the lock off over the seat belt to lock it into place. The Britax lock offs can sometimes be difficult to clip all the way. One tip for using the lock offs is to use the palm of your hand to close them, not your fingers. Recline needs to be in position three for rear facing installation no matter the installation method. The crotch buckle needs to in front of, not under the child. For seat belt installation, the crotch buckle needs to be in the closest position for threading the seat belt through. For lower anchor installation, the crotch buckle can be in either position as long as the buckle isn’t under the child. Lower anchor installation is allowed up to child weight of 50 pounds for forward facing. Recline positions one or two can be used forward facing. Recline position one must be used for children over 40 pounds, when installing with lap belt only. Both lower anchor and seat belt installations are just as easy forward as they are rear. For seat belt installation, thread the belt through the lockoff closest to the buckle. Buckle, tighten, then close the lockoff over the seat belt locking it into place. Our newborn Huggable Images doll weighs 7 pounds and is 17 inches long. She fit very well with the infant positioning pillow in place. It bumped her up just enough so that her shoulders were just barely above the bottom harness slots. I was pleasantly surprised to find that she fit nicely with the impact absorbing chest pads. These pads are highly recommended for forward facing, but can be removed rear facing to ensure a snug fit for small infants. This young model is 15 months old, weighs 25 pounds, and is 30 inches tall. The Boulevard also fits him very well without the infant positioning pillow. He’s on the third harness position and has the crotch strap in the outer position. He frequently sleeps in this seat with no complaints of being hot or uncomfortable. Our 3 year old model also fits well rear facing in the Boulevard. She weighs 25 pounds and is 34 inches tall. At 3 years old, she’s still safer rear facing than forward facing. She is actually on the same harness position as our younger model but has the crotch buckle on the smaller position. She has plenty of leg room in the seat. Our 3 year old model still weighs 25 pounds and is 34 inches tall. She fits as well in the seat forward facing as she fit in it rear facing. She has about three or four more harness positions to grow. I could see this seat lasting her for a long time to come. Our 6 year old Huggable Images doll, weighs 46 pounds and is 48 inches tall. We’re not terribly surprised that she barely fits in the Boulevard. Her shoulders are right at the highest harness position and her legs are hanging over the edge of the shallow seat pan. She still seemed to fit width wise well, although a typical child of this height and weight might be a bit snug. At her age, if she can sit properly, switching to a dedicated booster would be a safe choice. Date of manufacture can be found on the side of the car seat near the top, barely hiding under the cover. Expiration is 7 years and can be found on page 5 of the instruction manual. FAA approval label is on the outside of the seat’s base, and on page 6 of the instruction manual. 27" to the top of head support 24"
Highest harness position 16" 17" 18.65"
Britax has always made go-to seats for ease of use and installation. The only downfall to this Boulevard, and other previous Britax convertibles, is the short shell and shallow seat pan. None of these are a safety concern, but if you have larger children these complaints mean the child could outgrow the seat before they’re ready for the next step. Britax has addressed these issues with their newest convertible line up, the ClickTights. Read our review on the Britax Advocate ClickTight for more information on those. Overall, I’m pleased with the Britax Boulevard. They can be found on Amazon.com. Britax provided the Boulevard used in this review, CSFTL was not otherwise compensated and opinions, as always, are all our own. Originally written by Angela Tastad. Edits maintained by CSFTL.